Context: Congenital cataracts are one of the common eye disorders leading to visual impairment or blindness in children worldwide. We found a Chinese family with autosomal dominant pulverulent cataract. Aims: To identify the pathogenic gene mutation in a Chinese family with autosomal dominant inherited pulverulent cataract. Subjects and Methods: After obtained informed consent, detailed ophthalmic examinations were carried out; genomic DNAs were obtained from seven family members in a three-generation Chinese family with three affected. All exons of candidate genes were amplified by polymerase chain reaction and were sequenced performed by bidirectional sequencing. Results: By sequencing the encoding regions of the candidate genes, a missense mutation (c. 176C>T) was detected in gap junction protein alpha 3 genes (GJA3), which resulted in the substitution of highly conserved proline by leucine at codon 59 (p.P59L). The mutation co-segregated with all patients and was absent in 100 normal Chinese controls. Conclusions: The study identified a missense mutation (c. 176C>T) in GJA3 gene associated with autosomal dominant congenital pulverulent cataract in a Chinese family. It gave further evidence of phenotype heterogeneity for P59L mutation in GJA3 associated with congenital cataract. Congenital cataracts are one of the common eye disorders leading to visual impairment or blindness in children worldwide. Congenital cataract may be inherited or familial, either as an isolated form or as a part of a syndrome, such as Nance-Horan syndrome. Along with the development of molecular genetics, more than 20 genes have been identified to be involved in isolated cataract formation. The lens is an avascular organ which is composed of a monolayer of cuboidal epithelial cells covering the anterior surface of elongated fibers, which transmits and focuses light images onto the retina. Interior fiber cells, including both primary and secondary fiber cells, undergo a maturation process to eliminate all intracellular organelles, such as the nucleus, mitochondria, endoplasmic reticulum, and Golgi apparatus, thereby minimizing light scattering and ensuring lens transparency. The interior mature fibers have an extremely low metabolic activity and depend mainly on the epithelium and peripheral differential fibers for maintenance. Therefore, the lens has developed as a syncytium and a sophisticated cell-cell communication network, which facilitates both an active metabolism and transport of small metabolites, such as ions, water, and secondary messengers. Intercellular gap junction channels provide pathways for metabolic and electrical coupling between cells in the lens. Gap junction channels consist of connexin (Cx) protein subunits. To date, many Cx genes have been found in the mouse genome and the human genome. Mutations in Cx have been identified with various inherited diseases,  including Cx32 mutation in X-linked Charcot-Marie tooth disease, Cx26 and Cx30 mutations in deafness and skin diseases, Cx46 and Cx50 mutations in hereditary cataracts, and Cx31 mutation in erythrokeratodermia variabilis and hearing impairment with/without peripheral neuropathy. In our study, we found a missense mutation the substitution of proline to leucine of the codon 59 (p.P59L) in GJA3 (Cx46) associated with autosomal dominant pulverulent cataract in a Chinese family. A three-generation family with autosomal dominant congenital cataract was ascertained [Figure 1]. After explanation of nature and possible consequences of the study, seven individuals participated in the study. The study was performed with informed consent in accordance with the Declaration of Helsinki and following all the guidelines for experimental investigations required by the Institutional Review Board. The ophthalmologic examinations, including visual function and dilated slit-lamp examination, were carried out by ophthalmologists. Blood samples were collected, and leukocyte genomic DNA was extracted. All the exons of candidate genes which associated with autosomal dominant congenital cataract were amplified by polymerase chain reaction (PCR) method, including CRYAA, CRYBA1/A3, CRYBB2, CRYBB3, CRYGC, CRYGD, GJA3, and GJA8. The primers are listed in [Table 1]. 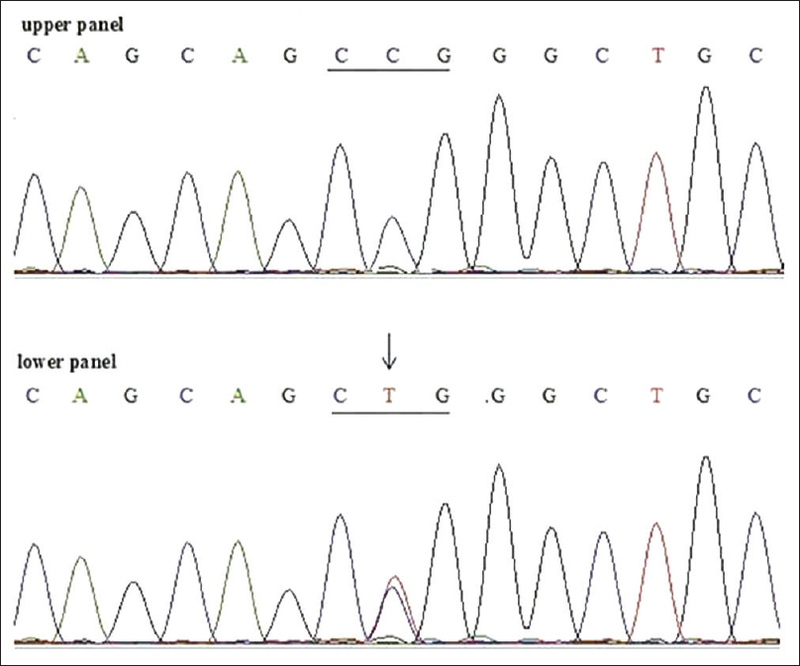 The PCR products were sequenced on both directions with an ABI 3130XL Genetic Analyzer (Applied Biosystems, Foster City, CA, USA). The results were analyzed using Chromas (version 2.23) software (http://www.technelysium.com.au/chromas.html) and compared with the reference sequences in the NCBI (http://www.ncbi.nlm.nih.gov/) gene bank. We studied a three-generation Chinese pedigree segregating autosomal dominant cataract in the absence of other ocular or systemic defects [Figure 1]. Ophthalmic records described the cataract as congenital bilateral irregular pulverulent cataract in three affected individuals (I: 2, II: 2, and III: 2) with corrected visual acuities <20/200, and the lens opacities were found at birth and progressed slowly with age; however, no slit-lamp images of the lens opacities presurgery were available. The affected individuals have had cataract surgery. Autosomal dominant inheritance mode of the cataract was supported by the presence of affected individuals in each of the three generations and equal opportunities to develop disease in female and male of each generation. By bidirectional sequencing of amplified exons of the candidate genes, we found a heterozygous missense mutation, C>T at position 176 in GJA3 (NM_021954) in affected individuals, but not in unaffected individuals. The c. 176C>T transition occurred at the second base of codon 59 (CCG > CTG) and was predicted to result in the missense substitution of proline to leucine (p.P59L) at the level of protein translation [Figure 2]. This mutation was not found in 100 unrelated control individuals. No other sequence variant was found. Based on the hydrophobicity profile of GJA3, the p.P59L substitution is likely located in the first extracellular (EC-1) loop. Cross-species alignment of GJA3 amino-acid sequences revealed that p.P59 is phylogenetically conserved [Figure 3]. In a Chinese family with congenital pulverulent cataract, we identified a missense mutation c. 176C>T in GJA3, leading to the substitution of proline by leucine (p.P59L). This mutation co-segregated with the phenotype and was not found in 100 unrelated control individuals. The p.P59L substitution was reported in USA, Danish, and Chinese family. Bennett et al. reported first the c. 176C>T mutation in GJA3 underlying autosomal dominant nuclear punctate cataracts in a six-generation Caucasian American pedigree in 2004. They speculated that the p.P59L substitution operated at the Cx (monomer) level prior to connexon (hexamer) formation, perhaps as a result of impaired targeting to the cell surface, accelerated degradation in a manner similar to that of the N63S mutant. , Then, Hansen et al. 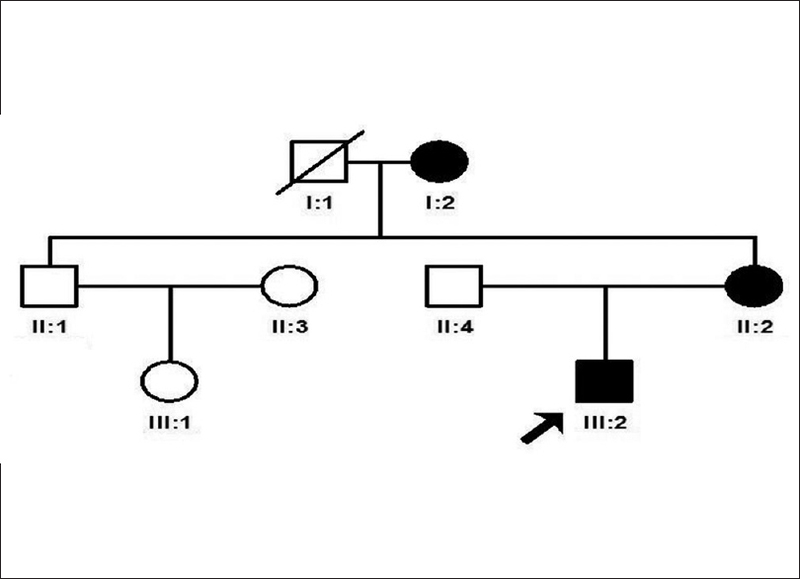 found this mutation in a Danish family with hereditary congenital cataract in a cohort study by comprehensive mutational screening in 2009. Sun et al. analyzed 12 genes in Chinese families with congenital cataracts and found the c. 176C>T in GJA3 that was not present in 96 controls and was predicted to be pathogenic with online bioinformatics tools - polymorphism phenotyping 2 and sorting intolerant from tolerant at the protein level. The p.P59L mutation of Cx46 might impair gap junction between lens fiber cells and lead to the development of cataract. The detailed phenotype was not described in the last two families. In the American family, the phenotype was described as nuclear punctate cataracts. In this study, the phenotype was described as bilateral irregular pulverulent cataracts according to the ophthalmic records. Our study gave further evidence of phenotype heterogeneity for P59L mutation in GJA3 associated with congenital cataract. Minogue et al. found p.G46V in EC-1 of Cx50 associated with congenital total cataracts, which forms normal gap junctions. , Expression of this mutant increases the proportion of apoptotic cells and causes cell death,  suggesting that opening of the hemichannels would also cause severe cell damage in vivo. Moreover, Ren et al. found that the p.G143R mutation on Cx46 associated with congenital Coppock cataracts has the increase of hemichannel activity, except for the reduction of gap junction. It is inferred that the increased hemichannel activity of this mutant is associated with decreased cell viability by disruption of intracellular microenvironment through a complex sequence of events including activation of kinases, imbalances of redox potentials, and accumulation of calcium. , This combination of the reduction of gap junction channel function and the increased hemichannel function is contributed to the development of human congenital cataracts. The hemichannel function of the p.P59L mutation in Cx46 should be further detected. The precise way in which this kind of mutations of Cxs causing cataract represents the next challenge in understanding the basis of Cx-mediated cataractogenesis. Youth Foundation of Scientific research project from Health Bureau of Shanghai (20114y055). Shiels A, Bennett TM, Hejtmancik JF. Cat-Map: Putting cataract on the map. Mol Vis 2010;16:2007-15. Bassnett S, Beebe DC. Coincident loss of mitochondria and nuclei during lens fiber cell differentiation. Dev Dyn 1992;194:85-93. Mathias RT, Rae JL, Baldo GJ. Physiological properties of the normal lens. Physiol Rev 1997;77:21-50. Willecke K, Eiberger J, Degen J, Eckardt D, Romualdi A, Güldenagel M, et al. 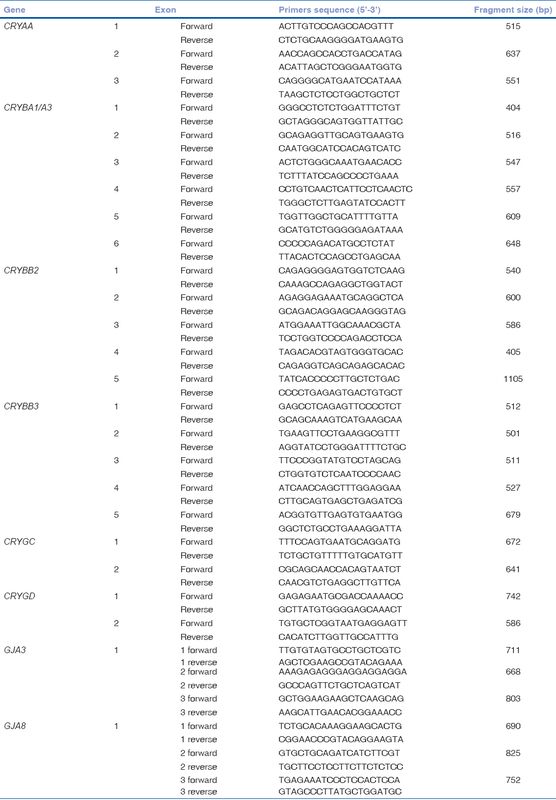 Structural and functional diversity of connexin genes in the mouse and human genome. Biol Chem 2002;383:725-37. Gerido DA, White TW. Connexin disorders of the ear, skin, and lens. Biochim Biophys Acta 2004;1662:159-70. Chenna R, Sugawara H, Koike T, Lopez R, Gibson TJ, Higgins DG, et al. Multiple sequence alignment with the Clustal series of programs. Nucleic Acids Res 2003;31:3497-500. Jones DT, Taylor WR, Thornton JM. A model recognition approach to the prediction of all-helical membrane protein structure and topology. Biochemistry 1994;33:3038-49. Gong X, Li E, Klier G, Huang Q, Wu Y, Lei H, et al. Disruption of alpha3 connexin gene leads to proteolysis and cataractogenesis in mice. Cell 1997;91:833-43. Gong X, Baldo GJ, Kumar NM, Gilula NB, Mathias RT. Gap junctional coupling in lenses lacking alpha3 connexin. Proc Natl Acad Sci U S A 1998;95:15303-8. Martinez-Wittinghan FJ, Sellitto C, White TW, Mathias RT, Paul D, Goodenough DA. Lens gap junctional coupling is modulated by connexin identity and the locus of gene expression. Invest Ophthalmol Vis Sci 2004;45:3629-37. Gong X, Cheng C, Xia CH. Connexins in lens development and cataractogenesis. J Membr Biol 2007;218:9-12. Simon AM, Goodenough DA. Diverse functions of vertebrate gap junctions. Trends Cell Biol 1998;8:477-83. Jiang JX, Goodenough DA. Heteromeric connexons in lens gap junction channels. Proc Natl Acad Sci U S A 1996;93:1287-91. Verselis VK, Ginter CS, Bargiello TA. Opposite voltage gating polarities of two closely related connexins. Nature 1994;368:348-51. Trexler EB, Bukauskas FF, Kronengold J, Bargiello TA, Verselis VK. The first extracellular loop domain is a major determinant of charge selectivity in connexin46 channels. Biophys J 2000;79:3036-51. Bennett TM, Mackay DS, Knopf HL, Shiels A. A novel missense mutation in the gene for gap-junction protein alpha3 (GJA3) associated with autosomal dominant "nuclear punctate" cataracts linked to chromosome 13q. Mol Vis 2004;10:376-82. Pal JD, Liu X, Mackay D, Shiels A, Berthoud VM, Beyer EC, et al. Connexin46 mutations linked to congenital cataract show loss of gap junction channel function. Am J Physiol Cell Physiol 2000;279:C596-602. Hansen L, Mikkelsen A, Nürnberg P, Nürnberg G, Anjum I, Eiberg H, et al. Comprehensive mutational screening in a cohort of Danish families with hereditary congenital cataract. Invest Ophthalmol Vis Sci 2009;50:3291-303. Sun W, Xiao X, Li S, Guo X, Zhang Q. Mutation analysis of 12 genes in Chinese families with congenital cataracts. Mol Vis 2011;17:2197-206. Minogue PJ, Tong JJ, Arora A, Russell-Eggitt I, Hunt DM, Moore AT, et al. A mutant connexin50 with enhanced hemichannel function leads to cell death. Invest Ophthalmol Vis Sci 2009;50:5837-45. Tong JJ, Minogue PJ, Guo W, Chen TL, Beyer EC, Berthoud VM, et al. Different consequences of cataract-associated mutations at adjacent positions in the first extracellular boundary of connexin50. Am J Physiol Cell Physiol 2011;300:C1055-64. Ren Q, Riquelme MA, Xu J, Yan X, Nicholson BJ, Gu S, et al. Cataract-causing mutation of human connexin 46 impairs gap junction, but increases hemichannel function and cell death. PLoS One 2013;8:e74732. Contreras JE, Sánchez HA, Véliz LP, Bukauskas FF, Bennett MV, Sáez JC. Role of connexin-based gap junction channels and hemichannels in ischemia-induced cell death in nervous tissue. Brain Res Brain Res Rev 2004;47:290-303. Beyer EC, Berthoud VM. Connexin hemichannels in the lens. Front Physiol 2014;5:20.